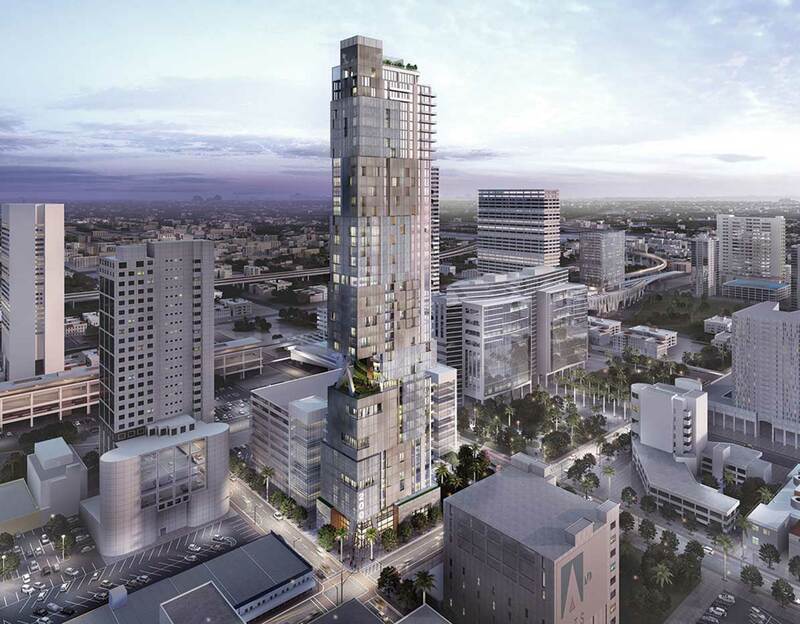 Developer Moishe Mana is planning to build a tall and slender residential tower in the heart of Miami’s urban core with not a single new parking space. But the project is to rise one block from the city’s new transportation hub known as MiamiCentral. The city’s new expanded train station now under construction will be home to Brightline, a high speed passenger rail service to Orlando, the Metrorail and Metromover, a Tri-Rail link, and connections to other modes of transportation including Metrobus, ride-sharing services, taxis and bicycles. The point: It should be easy to live in Mana’s new tower and not own a car. The city’s Urban Development Review Board recommended approval of the project, which remains nameless at this stage but is planned for 200 N Miami Ave. The tower is to rise 49 stories and include about 328 residential units aiming to attract a millennial crowd. Some of the lower apartments are expected to be small or micro units. David Lederman, an attorney representing the developer, said about a dozen stories will have the micro apartments, about 23 stories will be home to market rate apartments, and the top floors will be penthouse units. The site, 14,325 square feet at the northwest corner of Northwest Second Avenue and North Miami Avenue, is today home to a handful of small businesses in older two- to three-story buildings. The tower was designed by Zyscovich Architects, and the firm’s Suria Yaffar offered details to the review board about the project. While the tower has no parking, it will rise in an urban environment close to public transit, she said. MiamiCentral helps create “alternative choices of living” for those people wanting to reside downtown, she said. The tower’s micro units will be studio-sized, and the market rate apartments will be one- and two-bedroom units, Ms. Yaffar said. The development is to include two floors of amenities and a top pool deck. “It will be an exciting place to be at,” she said. The amenity options and common area spaces between floors will help keep the building lively, she said. The tower is to have a large lobby but no retail uses. Ms. Yaffar explained a unique design element on the outside of the planned tower. Mesh screens that can be moved, she said, will keep the façade on the upper levels fluid. She said tenants will be able to see through the material but it can shade the apartments. “The skin of the building is conceived as a movable sculpture; the screens will animate the building as they are opened or closed. The operable screens provide shade and reduce heat gain,” Ms. Yaffar said. Mr. Marston commented that he considers “architecture that changes” is a good thing. Board member Robin Bosco also liked the proposal, and congratulated the developer on an excellent project. “It’s very exciting. I’m looking forward to it,” said Mr. Bosco. While board member Dean Lewis expressed reservations about the sliding façade and how weather might affect the material, he said introduction of micro units in the area is important. The fact that developers don’t have to building parking can “bring down rents,” said Mr. Lewis, and this is an appropriate place for such a project. Mr. Lederman followed up on that point, noting that along with being near public transit the project is about 150 feet from a public parking garage. “This project is the future of Miami,” he said. Great! Finally, Miami is offering creative housing accommodation. Micro units options and a housing product without parking accommodations next to a transit hub is a great start. So happy there will be many hundreds of new downtown residents and ZERO new parking spots. But rarely in discussions of these types of developments is cycling mentioned. Like yeah ok, great, you can take Metrorail from here to work in… Brownsville? Hialeah? You can take the same buses everyone else takes from anywhere, no need for a hub. You can take Tri-Rail to work in… Boca? I guess, but then why have you moved downtown? The best transit option for physically able people around the urban core is a bicycle. The average speed on city streets is at least the same as a car. I hope bike parking is front and center in these buildings, very easily accessible for the tenants.